Without the root structure of a natural tooth, the jawbone can shrink, and thereby make your face look older. Many people who consider implants have removable, conventional dentures for lower and upper jaws, or removable bridges. These people experience a significant improvement in their ability to chew food comfortably after their dental implant treatment. At the first appointment, we use an X-ray to determine if the jaw bone is adequate to hold the titanium posts. Models of the mouth are often made using a soft, pliable plastic compound. These models show where the gaps are located and provide measurements for a replacement tooth or a bridge. Treatment with dental implants is complicated and takes meticulous planning for best results. 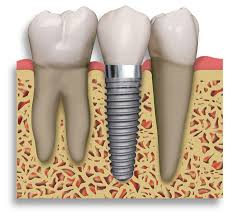 Today, the implants being placed often, only require one surgical procedure using a local anesthetic and sedative. Dental implant-supported replacement teeth look, feel and function like natural teeth. This means that you can eat and drink whatever you choose. But most importantly, dental implants improve the quality of life in a very concrete way. People who have felt embarrassed and worried because of their tooth problems are often overwhelmed by what new permanent teeth can do for their self-esteem.